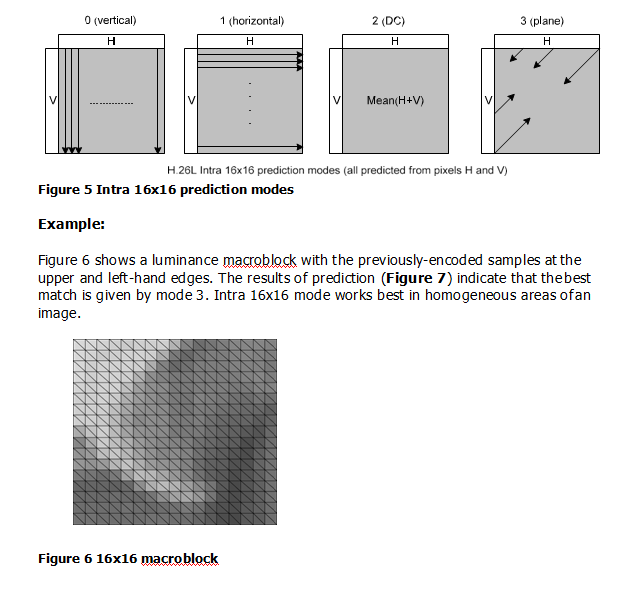 If a block or macroblock is encoded in intra mode, a prediction block is formed based on previously encoded and reconstructed (but un-filtered) blocks. This prediction block P is subtracted from the current block prior to encoding. For the luminance (luma) samples, P may be formed for each 4x4 sub-block or for a 16x16 macroblock. There are a total of 9 optional prediction modes for each 4x4 luma block; 4 optional modes for a 16x16 luma block; and one mode that is always applied to each 4x4 chroma block. 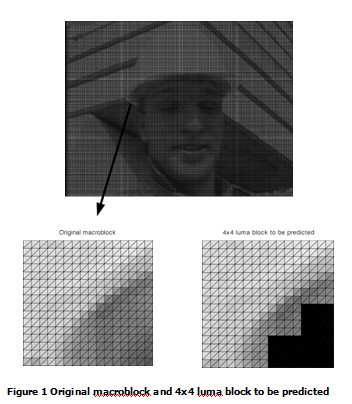 Figure 1 shows a luminance macroblock in a QCIF frame and a 4x4 luma block that is required to be predicted. The samples above and to the left have previously been encoded and reconstructed and are therefore available in the encoder and decoder to form a prediction reference. The prediction block P is calculated based on the samples labelled A-M in Figure 2, as follows. Note that in some cases, not all of the samples A- M are available within the current slice: in order to preserve independent decoding of slices, only samples within the current slice are available for prediction. DC prediction (mode 0) is modified depending on which samples A-M are available; the other modes (1-8) may only be used if all of the required prediction samples are available (except that, if E, F, G and H are not available, their value is copied from sample D). The arrows in Figure 3 indicate the direction of prediction in each mode. For modes 3- 8, the predicted samples are formed from a weighted average of the prediction samples A-Q. The encoder may select the prediction mode for each block that minimizes the residual between P and the block to be encoded. 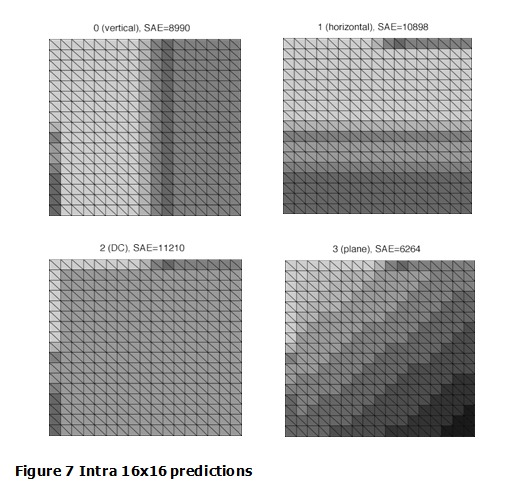 Example: The 9 prediction modes (0-8) are calculated for the 4x4 block shown in Figure 1. 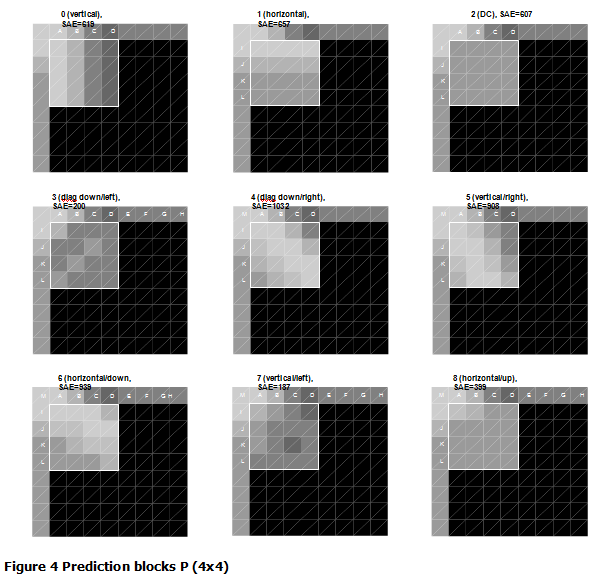 Figure 4 shows the prediction block P created by each of the predictions. The Sum of Absolute Errors (SAE) for each prediction indicates the magnitude of the prediction error. In this case, the best match to the actual current block is given by mode 7 (vertical-right) because this mode gives the smallest SAE; a visual comparison shows that the P block appears quite similar to the original 4x4 block. Mode 0 (vertical): extrapolation from upper samples (H). Mode 1 (horizontal): extrapolation from left samples (V). Mode 2 (DC): mean of upper and left-hand samples (H+V). Mode 4 (Plane): a linear “plane” function is fitted to the upper and left-hand samples H and V. This works well in areas of smoothly-varying luminance. Each 8x8 chroma component of a macroblock is predicted from chroma samples above and/or to the left that have previously been encoded and reconstructed. 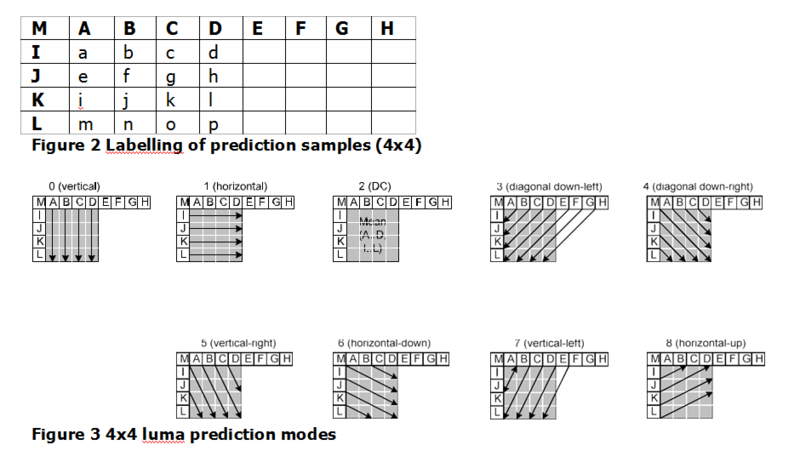 The 4 prediction modes are very similar to the 16x16 luma prediction modes described in section 3 and illustrated in Figure 5, except that the order of mode numbers is different: DC (mode 0), horizontal (mode 1), vertical (mode 2) and plane (mode 3). The same prediction mode is always applied to both chroma blocks. Note: if any of the 8x8 blocks in the luma component are coded in Intra mode, both chroma blocks are Intra coded. The choice of intra prediction mode for each 4x4 block must be signalled to the decoder and this could potentially require a large number of bits. However, intra modes for neighbouring 4x4 blocks are highly correlated. For example, if previously- encoded 4x4 blocks A and B in Figure 8 were predicted using mode 2, it is likely that the best mode for block C (current block) is also mode 2. For each current block C, the encoder and decoder calculate the most_probable_mode. If A and B are both coded in 4x4 intra mode and are both within the current slice, most_probable_mode is the minimum of the prediction modes of A and B; otherwise most_probable_mode is set to 2 (DC prediction). The encoder sends a flag for each 4x4 block, use_most_probable_mode. If the flag is “1”, the parameter most_probable_mode is used. If the flag is “0”, another parameter remaining_mode_selector is sent to indicate a change of mode. If remaining_mode_selector is smaller than the current most_probable_mode then the prediction mode is set to remaining_mode_selector; otherwise the prediction mode is set to remaining_mode_selector+1. In this way, only 8 values of remaining_mode_selector are required (0 to 7) to signal the current intra mode (0 to 8). Iain Richardson wrote the books on H.264 video compression.  A founder of Vcodex, he is changing the way video coding works.